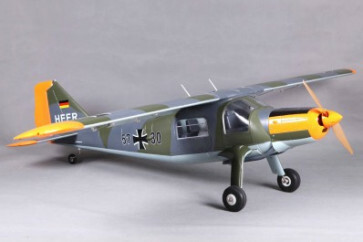 The Dornier DO-27 model has a modern high-quality foam construction and is characterized by many features that are not found in comparable models. The DO-27 has the combined the flight behavior and the appearance of a wooden model with the easy handling of a foam model. The construction has many new innovations: superior strength foam, a sturdy landing gear, good engine performance, great scale details, a wooden propeller, position lights and exhaust pipes. The DO-27 with its easy lock wings can quickly be set-up and disassembled at the flying field. Two carbon fiber wing spars won`t let the wing twist in flight and the landing gear is designed for almost every flying field. The flight characteristics are unbelievable - power like the original and a great flying silhouette make this a real crowd pleaser. The flaps give our DO-27 a large speed range and will make your landings easy. The model is designed for pilots who want to fly their model scale-like and enjoy magnificent deep overflights and yet try your hand at some aerobatic training. The stiff wing and the good engine performance make classic aerobatic maneuvers (loops, rolls and turns) gorgeous.